Well, Well, Well, would you look at that? Google was handed yet another fine by the European Union. This time around it’s a fine of whopping $5 billion (€4.3 billion). Looks like the love story between EU and Google will continue for a while (wink! Wink!). This is actually the 2nd time Google has been fined by the EU. In 2017 Google was fined $2.8 billion for manipulating search result. Shopping results to be more precise. This time around though, the EU regulators have fined Google for 3 types of illegal restriction on the use of Android OS. What did Google do to deserve this? As per the EU Google’s dominance of Android “has cemented the dominance of its search engine”. Well, how is that you ask? Allow me to break it down to you. So, we know that Android is an open source system. Meaning anyone can fork the system and modify it. But what Google has done is that they make sure all the Big companies like Samsung, LG, etc. ship their phones with Google apps in them. Specifically, google search and google chrome. Because these apps are tied to both Google and Android. 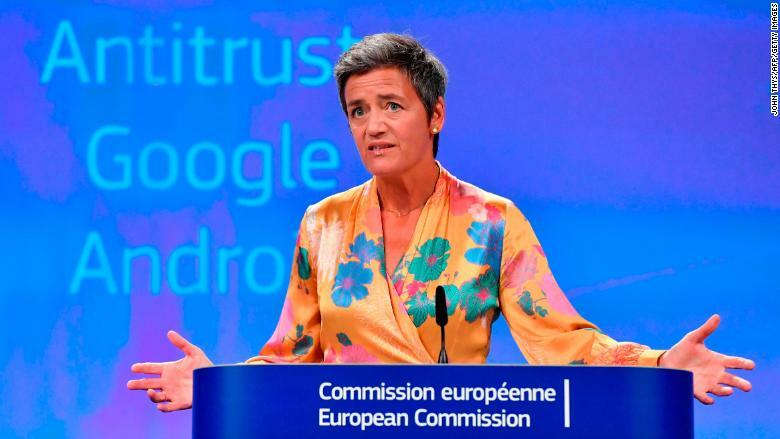 The EU feels like Google is breaking antitrust rules. Their main concern is that the rules which are put together by Google make it very hard/impossible for their competitors to have any leeway to actually compete in this market. In a sense, this makes Google a monopoly. Another concern was that Google made illegal payments to manufacturers and mobile network companies to bundle their devices with Google search. The European Union has given Google a 90-day timeframe to unbundle Google Chrome and Google Search from their software. Google being Google, plan on appealing against the EU (Rightfully so IMHO). Pretty sure this will go on for years. Why should You or I care? Okay, let’s put our thinking hat for a moment now. So, the entire Android system is built around this idea of “FREE” software, right? Then how does Google pay for the maintenance? or generate revenue off of Android? So, now imagine a scenario where Google can’t put Google search on Android devices. That implies that they will make less money. In such a scenario Google will only have 2 options. Either shutdown Android altogether (we all know that’s not gonna happen) or charge for the OS (Bingo!!!). Well, Google will certainly not charge from us (the end users). They will start charging the handset makers. Then, the handset makers will charge more for their phones. At the end of the day, You and I are the ones who will pay the extra money. Keep in mind that this is all hypothetical. As of now, we are safe. This war between Google and EU can go back and forth for a long time. Until things settle down, Android will still ship with prebuilt Google apps. I’m with Google in this case (Although, being an Android enthusiast, my standings are kinda biased here). However, I truly believe Google has created is a very diverse and unique eco system. Everyone can afford a smartphone that runs on Android. You don’t have to break your bank to own an Android device. Android being free has created a huge potential for end users and phone manufacturers. More importantly, Google apps area great. The concept of bloatware in Android came from the fact that people love Google apps. Most people prefer stock Android over any other skin of Android. If EU were to take away that freedom from Google, I fear things might go south for us. In EUs defense, What I believe they are trying to do is give competitors and end users to have more freedom. More choice to be precise. Let the end users choose what services they want to use. In that way, competitors can at least have the chance to innovate and compete. As of now, the commission is trying to stop Google from bundling their services from android. They don’t want Google to change the Android ecosystem drastically. So, what are your thoughts on this issue? Are you with Google or EU? As always, feel free to let us know your thoughts in the comment section below.